Defending the Holy Faith isn't easy. There are times in life when you've just got to 'getaway'. That's why Bespoke Priestholes Ltd have been offering our unique, high-quality brand to parishes for nearly five centuries, adapting buildings both new and old to add sanctuary and security to the life of clergy. 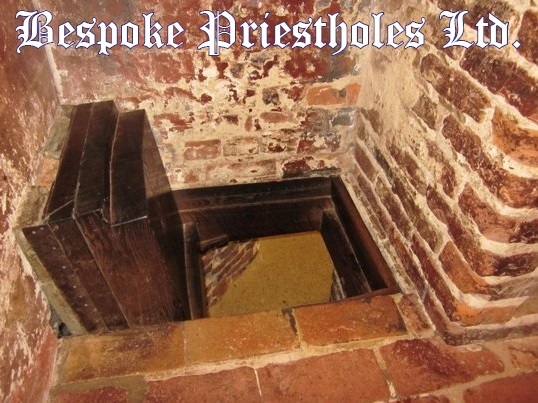 Since Tudor times, Bespoke Priestholes Ltd have offered a range of in-house ecclesiastical hiding holes to the clergy in England and Wales, promising a discreet service, impeccable finishing touches and a variety of internal retreat holes in basements, bookcases, walls and lofts and all at a price that won't go through the roof. Take advantage of Bespoke Priestholes Ltd's 'Year of Mercy' discounts, with as much as 20% off our top range of priestly sanctuaries for the Extraordinary Year, during which it is promised that 'Catholic fundamentalists' will be 'combated'. We've heard that kind of language before. Our carpenters are ready. Are you? Our prices cannot be beaten. Don't wait for persecution, expect it. We're on hand to deliver the holes that can deliver you from your enemies. With over 500 years of experience, we've got the expertise that can come to your assistance. Because you never know who's going to knock on your Presbytery door. Super, Bones! Your the world's best at black humour. They should book you as the in-flight entertainment on the next papal trip. Bones, if possible you have outdone yourself!!!!! An unholy year of extreme persecution and diabolic disorientation - we must do reparation for this institutionalising of Francis's heretical programme of destruction of Faith and morals. If Francis refuses to bend his knee to God and be persecuted for upholding the Faith, in his short time left on Earth, he will go into a hole for all time. Hilarious! Every line! Unfortunately it's probably not far from truth. Actually there are a few priests in the States here who could have used one. And the sale prices sound promising. That's mercy! Yeah, man, but I need a bespoke laity-hole. We need to close the doctrinal hole. You joke, but the days of visiting priests, as and when may not be all that far off. And I can think of several groups who might want to "get" them. So, a good range of disguises is next. Come Bones, use your imagination? Archbishop Porteous might be your next customer. Thank you for the link. I read it. In my estimation the suit is misdirected if it does not specifically name the Supreme Pontiff of the Catholic Church as the principal Defendant as the ethic and subsequent instruction of Archbishop Julian Porteous of the Archdiocese of Hobart in Tasmania, flows directly and immediately from doctrines of the Catholic Church, the chief Defender of which is Francis, the man who is the immediate employer of the Archbishop of Hobart. Francis should appear in the dock to defend the Catholic Church's doctrines on marriage and sexuality. Perhaps he is booking his next flight even now. As a matter of law, however, Francis (ironically) must be a named Defendant. I have some passing familiarity with the law. Can a Catholic Be Righteous in the Sight of God?